For those with smaller sized gardens and limited storage the Napoleon Rogue 425 Stainless Steel Natural Gas Grill is a godsend, given that it is smaller than other grills. Even better is the fold down shelves which reduce the amount of space required and also act as handy storage units when folded down. If simplicity is your thing then look no further than the Blaze 3-Burner Freestanding Stainless Steel Natural Gas Grill. There's nothing complicated about it, and it is very easy to ignite and control the burner. You have grill separators to make it very easy to cook different foods, all at the same time. 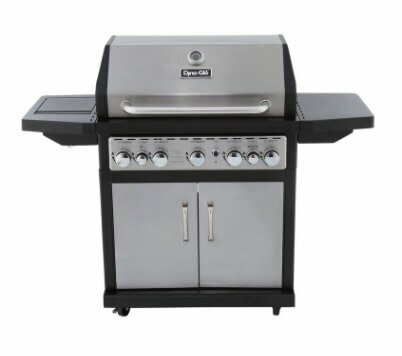 Our top choice in our search for the best stainless steel natural gas grill is the Dyna-Glo Stainless Steel 5-Burner Natural Gas Grill. This is a grill that has all the versatility any BBQ chef would want, with a price ticket that we had to look at twice to believe it was for real. The main grill has the capacity to cook over 25 burgers at a time so there's plenty of capacity if you need to cook for a few extra guests. Each of the burners is individually controlled and they are lit easily using the electronic ignition system. Each burner has 12,000 BTUs so whether you are searing meat or warming it gently you can set the heat at the perfect setting. At the rear, you have an infra-red rotisserie burner which is ideal for cooking meats evenly and if that wasn't enough there is a side burner which can be used for boiling or frying side dishes. Adding all that up means you have a total of 764 sq. inches of cooking area and 79,000 BTUs which allows you to cater for everything from an intimate steak dinner, to a full-sized BBQ garden party. To help you whilst you cook there are two side shelves for holding BBQ tools, condiments and cutlery plus there's further storage under the grill, thanks to the two-door cabinet. ==> Get It From Home Depot Here! Cooking a BBQ in your garden should be an enjoyable experience and the more your grill can do to help you the greater that enjoyment will be. 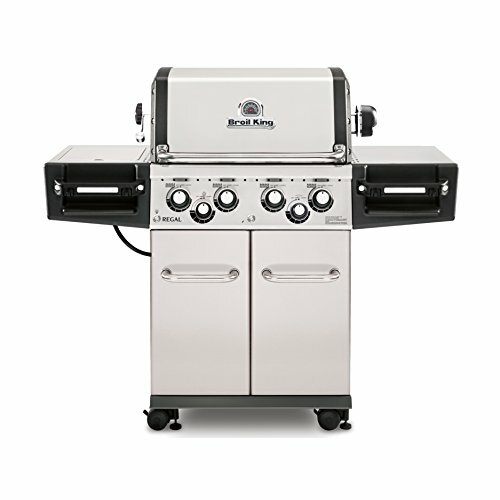 The Broil King Regal S490 Pro Stainless Steel 4 Burner Natural Gas Grill is one such grill with just about everything a BBQ chef needs to get those steaks and burgers just right. The main grill has 4 burners which deliver up to 50,000 BTUs of cooking heat and give you a main cooking area of 500 square inches. Each burner is ignited electronically and can be adjusted individually for maximum control over cooking speeds and temperatures. Additional cooking capacity comes from the rear rotisserie which has one of the very best spit rods and motor units we have seen. This is ideal for roasting chicken or pork joints especially when you are cooking for a larger crowd. If you want to give your guests some fried food, boiled vegetables, or if you want to create your very own sauce recipes, you can do so thanks to the 10,000 BTU side burner. Convenience seems to the name of the game with this grill as apart from all the cooking capacity, the job is made easier for you with a storage cupboard, two side shelves, which have both hooks for hanging your BBQ tools, and cup holders, just in case you want to sip on a cold drink whilst you cook everyone's steaks to perfection. When you see the name ‘Weber' on a grill, it means you are looking at a quality product. After all, they didn't become one of the world's top manufacturers of cooking equipment by accident. 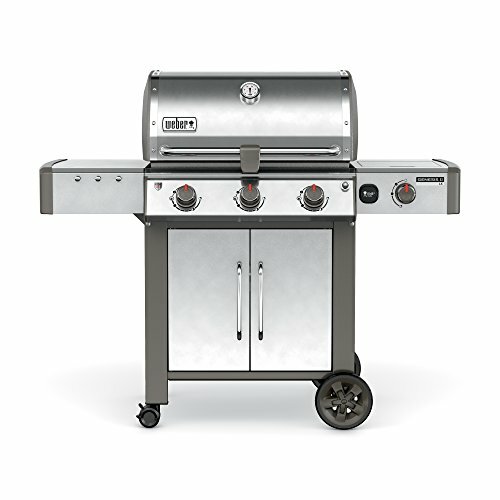 With the Weber Genesis II LX S-340 Stainless Steel Natural Gas Grill they have produced another top-drawer product. This grill is probably more suited to smaller BBQs as it only has three burners, albeit they each produce a respectable 12, 000 BTUs of heat so there is no lack of cooking power. Also, the fact that the main grill area is 513 sq. inches means it is still going to be able to cook everything at once rather than in installments. This is helped by the fold down warming rack which means cooked food can be kept warm until serving time. A side burner also means that side dishes and sauces can be cooked separately from the main grill. Weber's ‘infinity' ignition system ensures the burners light quickly every time, and once they are lit you can control them easily using the individual backlit control knobs. Keeping with the theme of making life easy for you, a grease management system ensures that when it is time clean up, it is not a difficult chore. If all that wasn't enough, there is a fold down side shelf, a storage unit and hooks for holding your BBQ tools. If all that wasn't enough, there is a fold down side shelf, a storage unit and hooks for holding your BBQ tools. 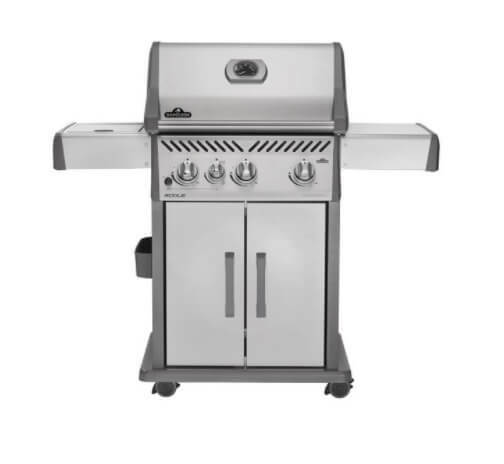 If you love having BBQs and cookouts but have a smaller garden or limited storage space, then the Napoleon Rogue 425 Stainless Steel Natural Gas Grill could be the answer. The reasons are, not only are its dimensions somewhat smaller than most stainless-steel grills, its two sides shelves also both fold down. This helps when you have a smaller area in which to cook or have a lack of room to store it away. A great feature of these shelves is that when they are folded down when the grill is used, you can use them to store tools and cutlery which not only saves space but is also more convenient for everyone, especially the chef. A great feature of these shelves is if they are folded down when the grill is being used to cook, you can use them to store tools and cutlery which not only saves space but is also more convenient for everyone, especially the chef. Although it is a slightly smaller grill, the Napoleon Rogue 425 can still cook a decent amount of food for you and your guests. It has 3 main burners with a total output of 36,000 BTUs so plenty of steaks, chicken, and burgers can be on the go at the same time. There is also a side burner which can act either as an additional grill or be used to make a stir fry or even soup. Other great features are a side holder for condiments and a two-door storage unit underneath to store other items such as the grill cover, and your BBQ tools when not in use. • Ideal if space or storage is limited. If you are looking for a grill that is simple and straightforward to use, then the Blaze 3-Burner Freestanding Stainless Steel Natural Gas Grill fits the bill completely. A first glance at this grill tells you that there's nothing complicated about it, so instead of reading 10 pages of instructions, you can instead concentrate on cooking the food straight away. The grill has three natural gas burners, which each produce a very respectable 14,000 BTUs each. There a cooking area of 558 square inches so that gives you plenty of room to place the steaks, chicken, corn, spuds and even have some left over for the odd stuffed pepper or two. To enable you to cook at different speeds and temperatures, each burner has its own controller, and stainless steel separators effectively split your grill into three so each food type is cooked just right. As your food is cooked it can be placed on the removable warming rack, so when it is time to serve, everything can be dished up together. Two side shelves can be used to help serve or to hold cutlery and condiments for your guests. When all the festivities are over, you can store your tools and other accessories in the storage unit, or use it for the grill cover whilst the grill is in use. ==> Get It From BBQ Guys Here! The amount of cooking capacity you'll need will obviously depend on the number of guests you normally invite when you have a BBQ. For some that will mean just immediate family so other than the main grill to cook some steak and burgers the need for additional capacity doesn't exist. On the other hand, if you like to have large garden parties, you're not only going to need a larger main grill area, but an additional side burner, infrared rotisserie, and a warming area are all recommended so that you can cope with the larger amount of food that needs to be cooked. Cooking flexibility refers to the ability to control each burner individually, which should normally be the case for any decent natural gas grill. Some might also offer grill separators which effectively split the grill into different cooking sections for added cooking options in terms of temperatures for different foods. Ease of use firstly applies to the cooking functions, so look for electronic ignitions and simple controllers. In addition to the actual cooking, grills which have very convenient features like folding shelves, accessory hooks, storage units, and drinks holders all make the experience of cooking BBQ food, much more enjoyable. Everyone has a budget in mind, no matter what product they are thinking of buying and presumably this will be same for you when buying a stainless steel natural gas grill. These grills can have a considerable range of prices, starting from a few hundred dollars, all the way up to several thousand. Don't make the mistake of thinking just because something has a very high-ticket price, it is going to be light years ahead of a product a fraction of its price. One of the very insightful points you will find amongst the grills we have reviewed, is that within the stainless steel natural gas grill market there are several very impressive products that are priced very competitively. 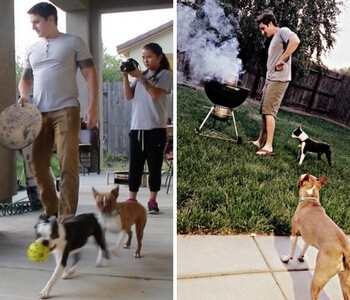 Whenever there is a BBQ, whether it's just the family having a few burgers, or a full-blown party with lots of neighbors, friends, and family, the whole point is that everyone has a good time, great food, and enjoys themselves. In most cases, everyone will, and this must extend to the BBQ chef too! Whether that chef is mom, dad, Uncle Harry, or the guy from down the street who is an expert at cooking steak, they have as much right to enjoy themselves as anyone else, and this is where a stainless steel natural gas grill hits the mark. Now we accept there are some who insist that a BBQ is not a BBQ unless charcoal or wood chips being used for the fuel, and if that includes you we are not going to try to change your mind on that. However, using a natural gas grill to cook steaks, chicken, sausages, burgers, corns or potatoes, does not mean that the food is going to taste any less delicious. The benefit to the chef of using a natural gas grill is firstly how easy it is to light the burners, which in most cases is literally at the flick of a switch with the use of electronic ignition. This means the chef can get on with starting to cook food straight away. Compare that with charcoal or wood chips, which take time to light and then even longer to start burning at a sufficient heat level to cook food with. Once the chef has started cooking they are able to set the burner on a stainless steel natural gas grill to exactly the right setting for whatever food they are cooking. This is done with simple to operate control knobs which regulate the flame on each individual burner. Some grills also have stainless steel separators so that foods can be separated out to cook at different heat levels. With other fuels that can't be controlled with this level of flexibility, it is much harder to regulate as all the fuel is burning at the same intensity so the chef has a more difficult task. With natural gas grills, chefs can also have additional cooking capacity and flexibility with a side burner, rear rotisserie or warming area at their disposal, depending on the model. These allow the BBQ chef to cook additional foods and sauces whilst the main grill takes care of the steaks and burgers. They are also able to keep food warm in readiness for serving whilst everything else continues cooking. The job of a BBQ chef is also made much easier if everything they need to cook food is at hand and easy to reach. Most stainless steel natural gas grills come with side shelves where condiments can be placed, therefore when the chef wants to add flavoring, seasoning or a sauce to anything they are cooking, they are all within easy reach. Side hooks for grilling tools also make the chef's life easier, and some grills also have additional storage bins where these can be placed. There are even some natural gas grills with a drinking cup holder so the chef can have a refreshing cold drink to help keep them cool from all the heat generated from the grill. If you or your nominated BBQ chef simply love the act of cooking it might be that is all you need to have enjoyment at your next BBQ. However, it is surely made more fun, by the extra flexibility and convenience that a stainless steel natural gas grill can give you as those steaks brown, and the sausages sizzle.